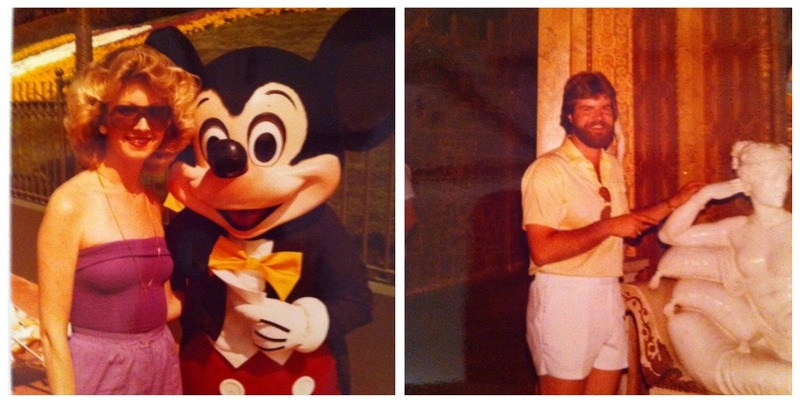 How much are you loving my mom’s purple tube top and my dad’s short white shorts? Surely not as much as I am. 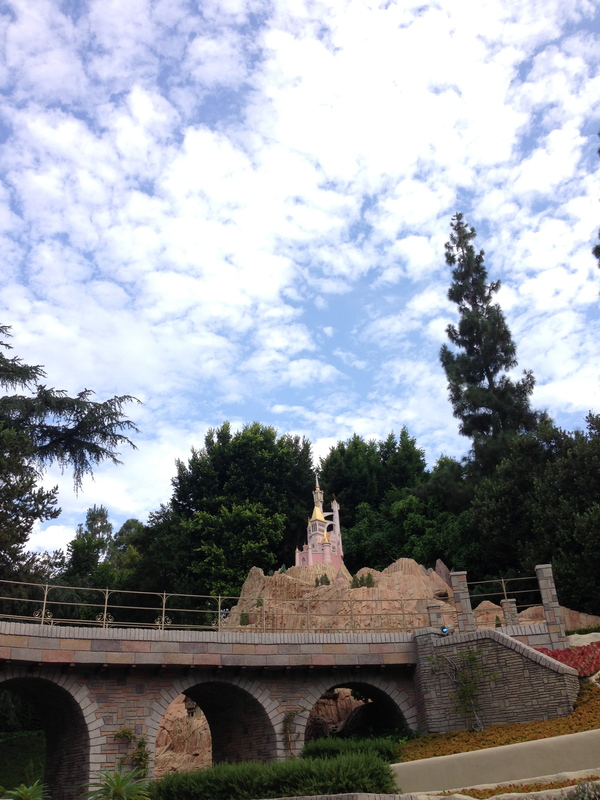 Anyway, as I was saying…it was Sunday, and we were heading to Disneyland! 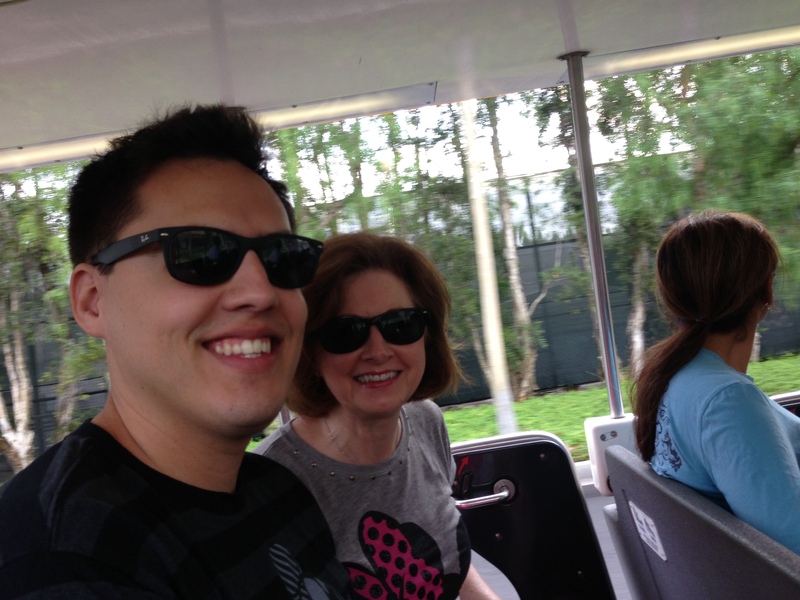 When we finally arrived at the park, we hopped on a tram and headed to Disneyland! We were obviously super psyched to be there. We lined up on Main Street right in front of the castle, and as soon as the park officially opened, we headed straight for Fantasyland. 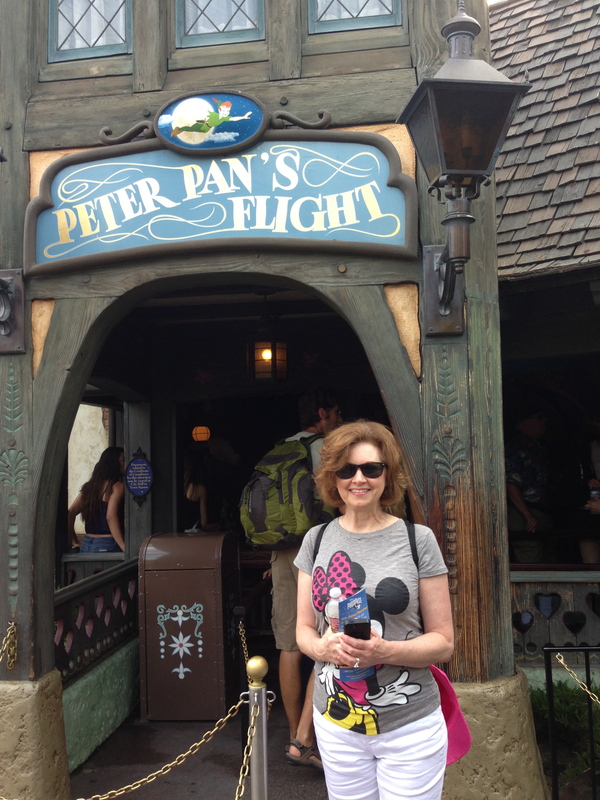 My mom’s favorite Disney ride is Peter Pan’s Flight, so we wanted to make that our first ride of the day. 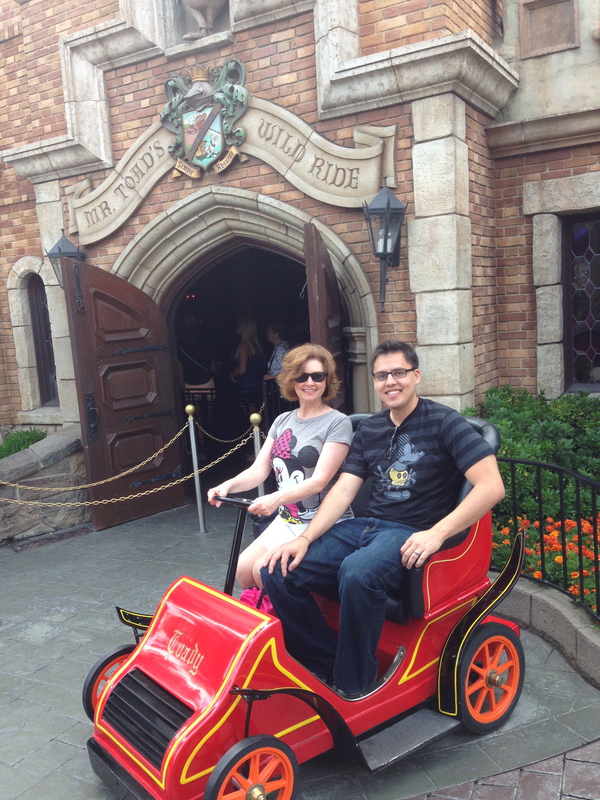 After boarding a magical flying ship to travel over London with Peter, we decided to enjoy the rest of Fantasyland. 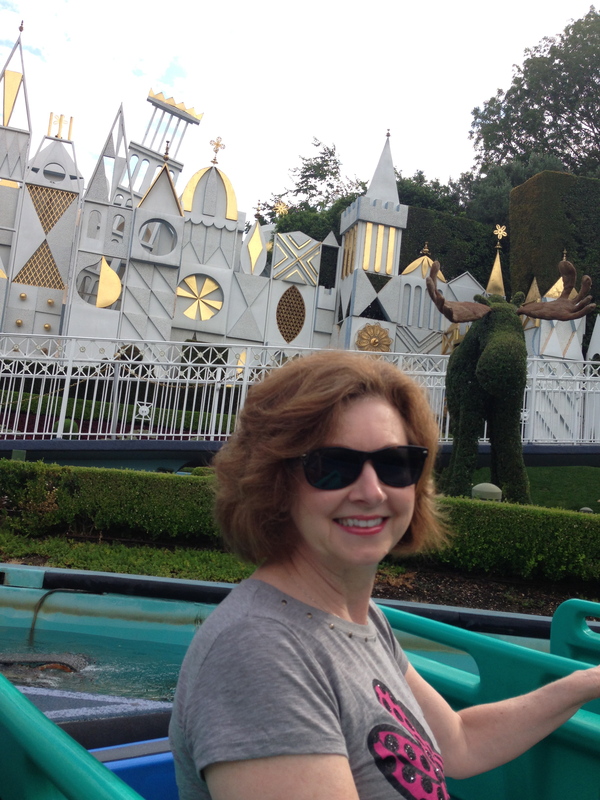 That included Snow White’s Scary Adventure (which actually seriously scares me), Mr. Toad’s Wild Ride (which ends with the rider traveling to Hell…I can’t make this stuff up), and pictures in front of some various Fantasyland landmarks. 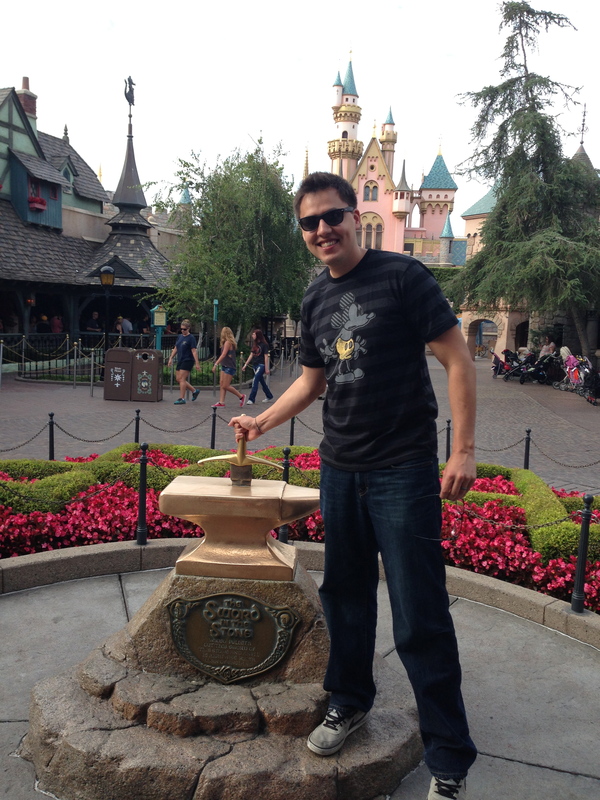 Trying to pull the sword out of the stone behind Sleeping Beauty Castle! 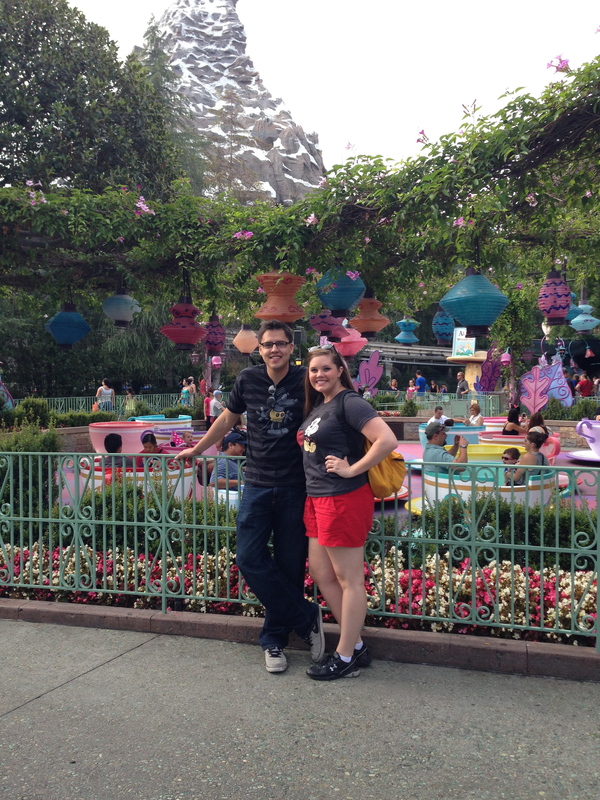 In front of the teacups and Matterhorn Mountain! 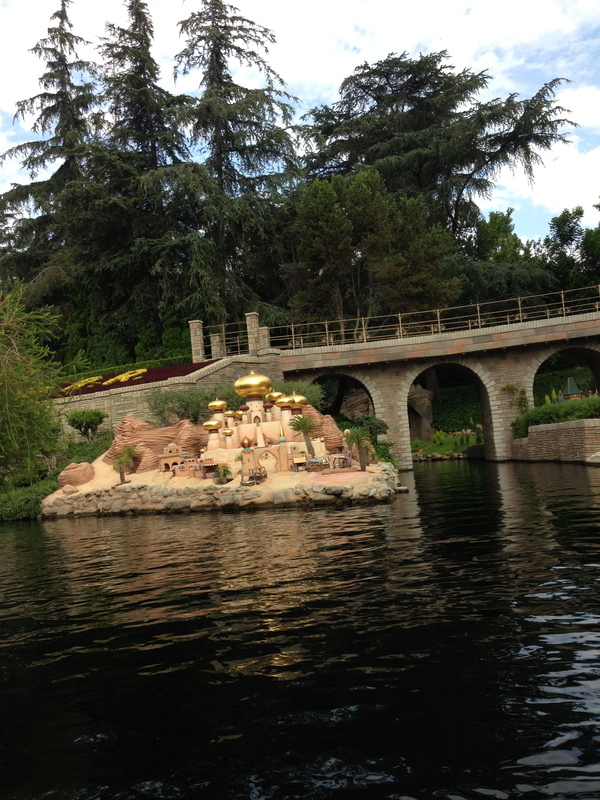 We also made sure to enjoy a couple of boat rides near Fantasyland. 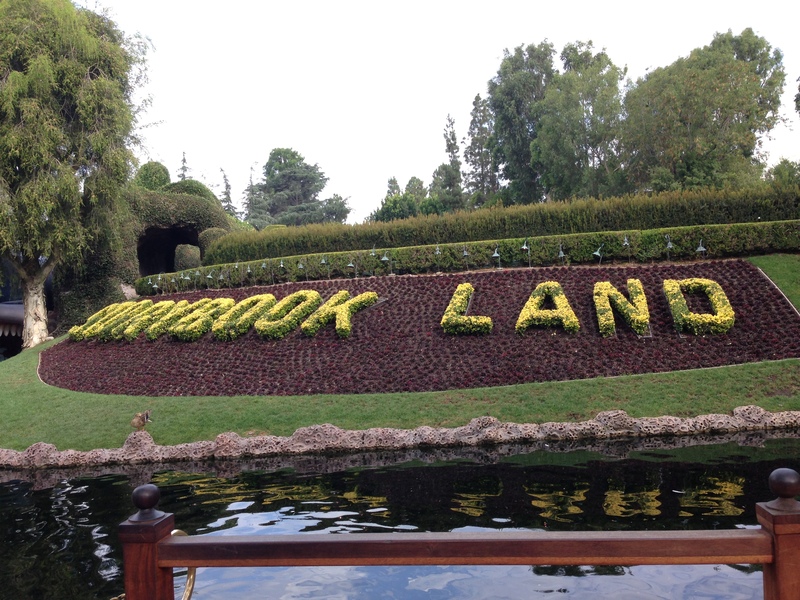 The first was Storybook Land Canal boats. 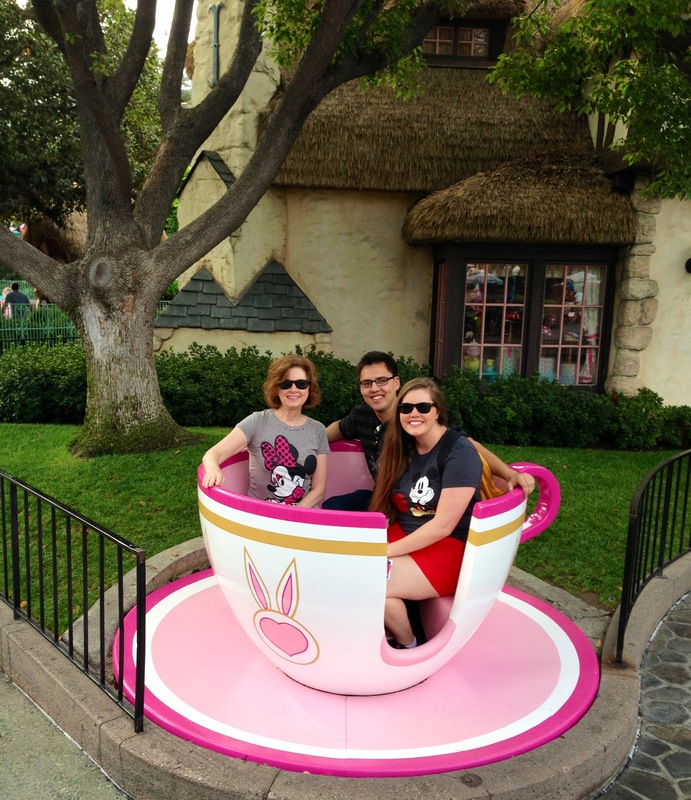 This ride was so cute! 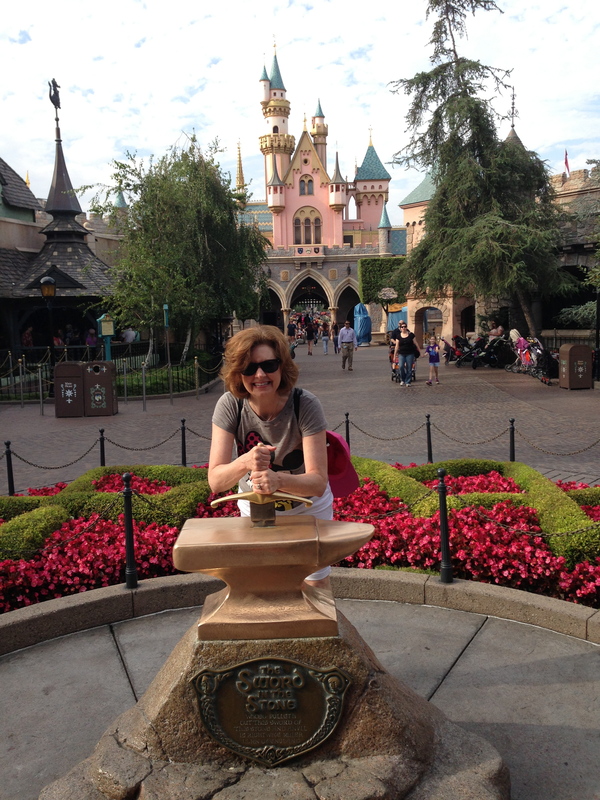 We hadn’t been on it before, and it was full of miniature sculptures from various Disney movies. The sights may look unimpressive below, but they were beautifully crafted and the accompanying music and tour guide really made this ride special. 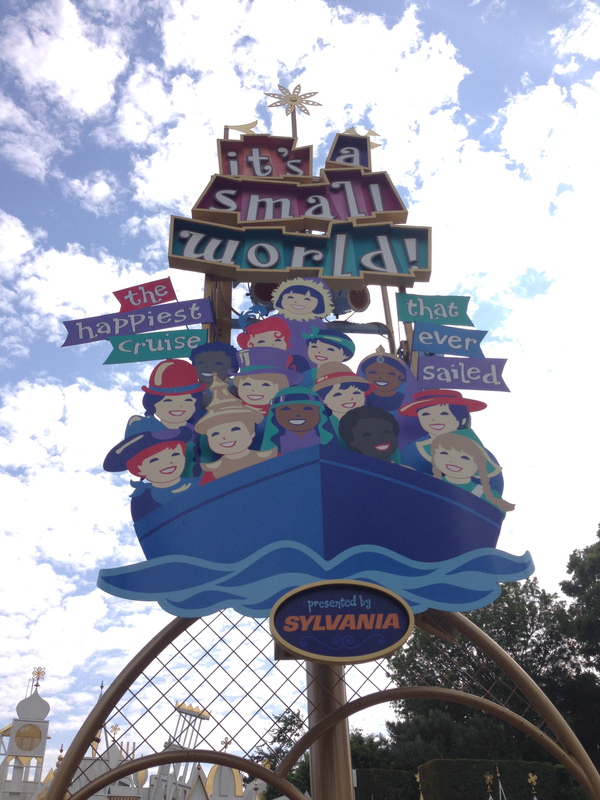 Another boat ride we had to enjoy was “it’s a small world.” No trip to a Disney park is complete without riding this classic at least once. 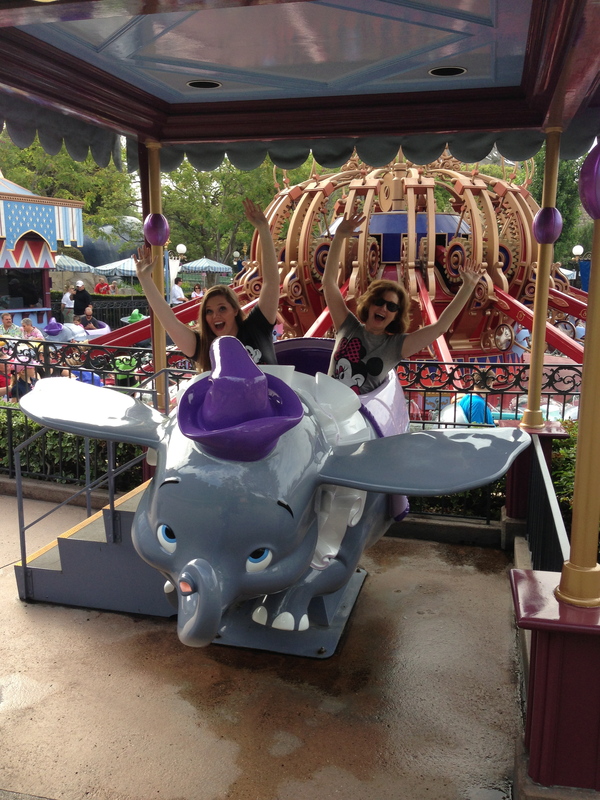 Even though this ride is also at Disney World, the Disneyland version has integrated some Disney characters and princesses throughout their version of the ride. It was fun to try to seek them out in their respective countries and states! 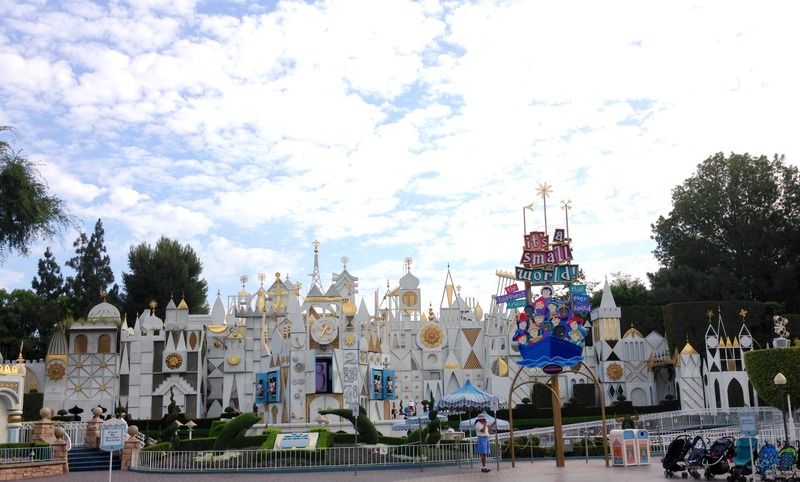 I won’t bore you with pictures of the inside of the ride, but trust me that it’s a happy, fun Disney classic! The facade here is much larger than Disney World’s! The happiest cruise that ever sailed! We then made the very unfortunate decision to go on Finding Nemo Submarines. We had heard great things about how fun it was. Nope. It was so crowded and claustrophobic. 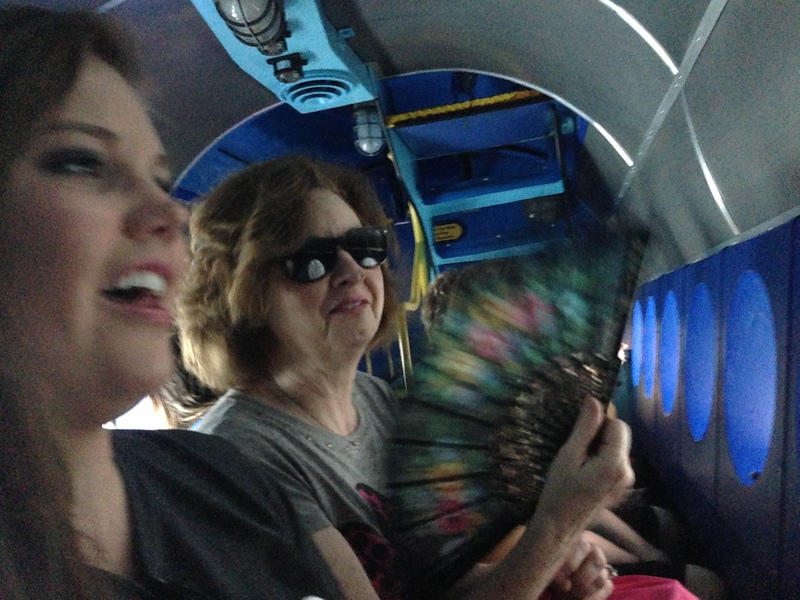 My mom immediately pulled out her fan to cool herself off, and poor Louis was so tall he could barely bend down far enough to see out of the submarine window. We thought the ride would never end. 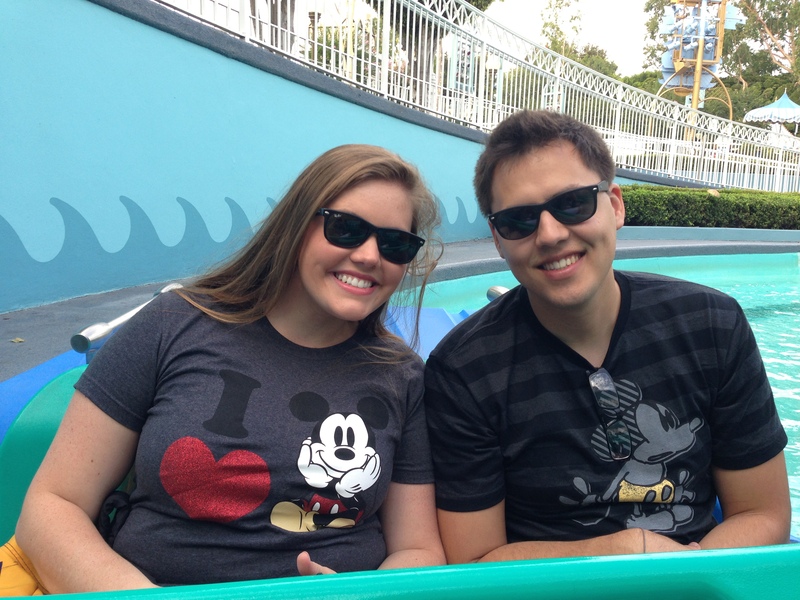 You may notice above that we all have on Mickey or Minnie shirts. I am always down for wearing character shirts, but Louis isn’t such a huge fan. 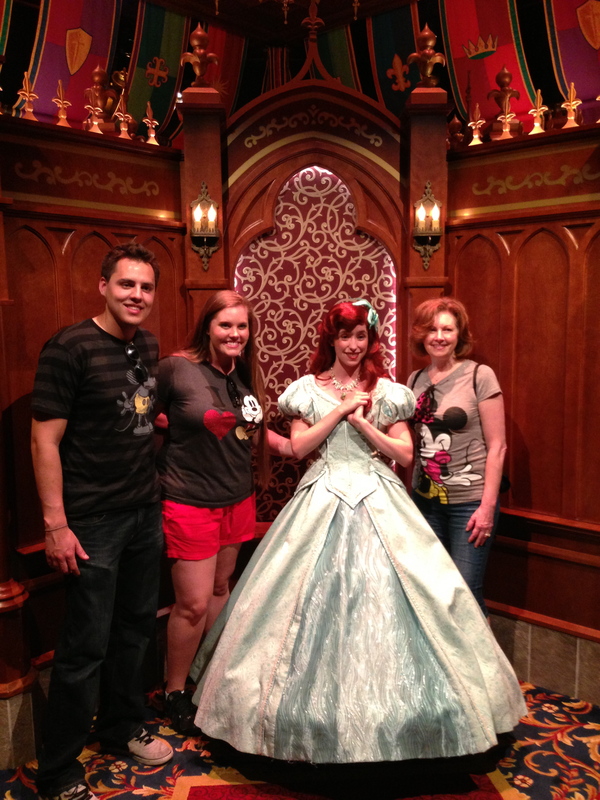 My mom really wanted us all in Disney shirts for pictures though. She asked Louis if she promised to ride Space Mountain if he would bite the bullet and wear a Mickey shirt. He only agreed if she would ride Splash Mountain as well. Shocking all of us (probably herself most of all), she AGREED! Louis and I hustled over to the Disney store before she arrived and found the coolest Mickey shirt I’ve ever seen. 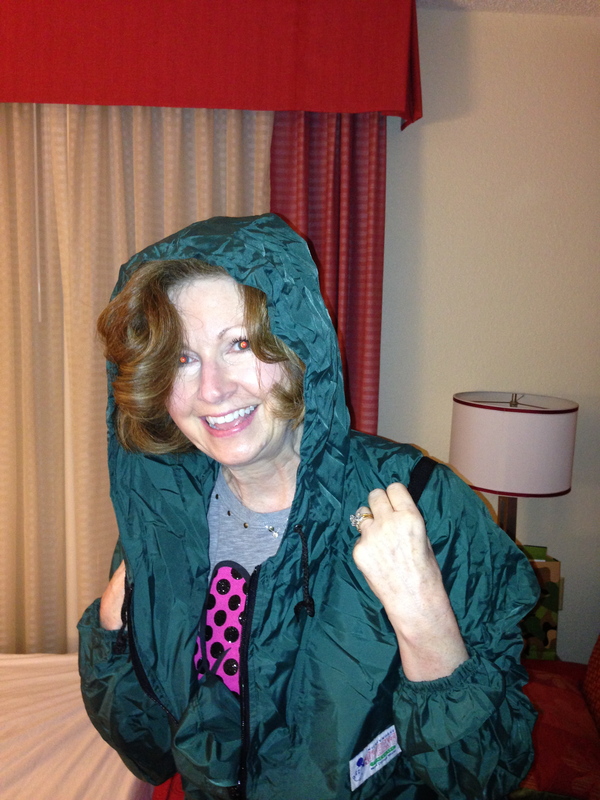 Then, my poor mom was locked into facing her fear of thrill rides. 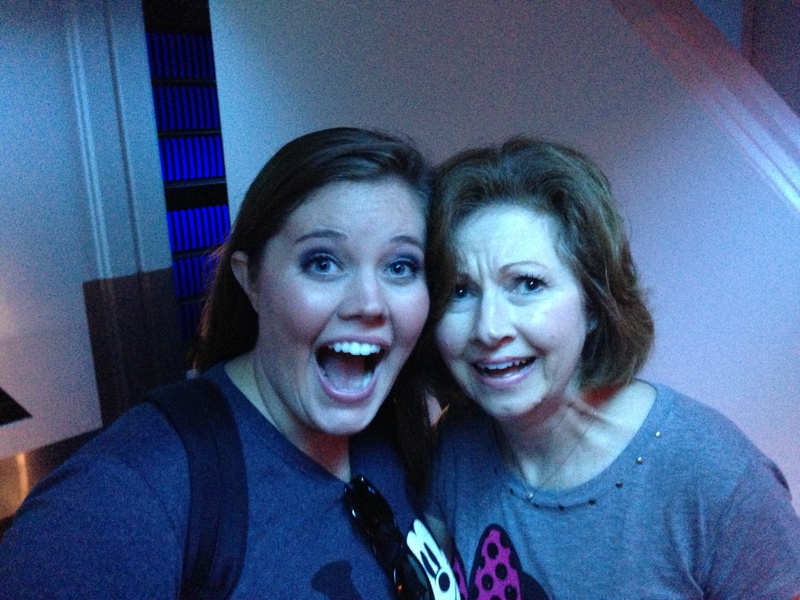 After Fantasyland, we finally convinced her it was time to tackle her first terror of the day: Space Mountain. I can safely promise to everyone reading this, that I have never laughed as hard in my ENTIRE LIFE as I did when my mom rode Space Mountain. I was laughing so hard I almost threw up. Yes. Threw up from laughter. Too many great things going on in this photo. 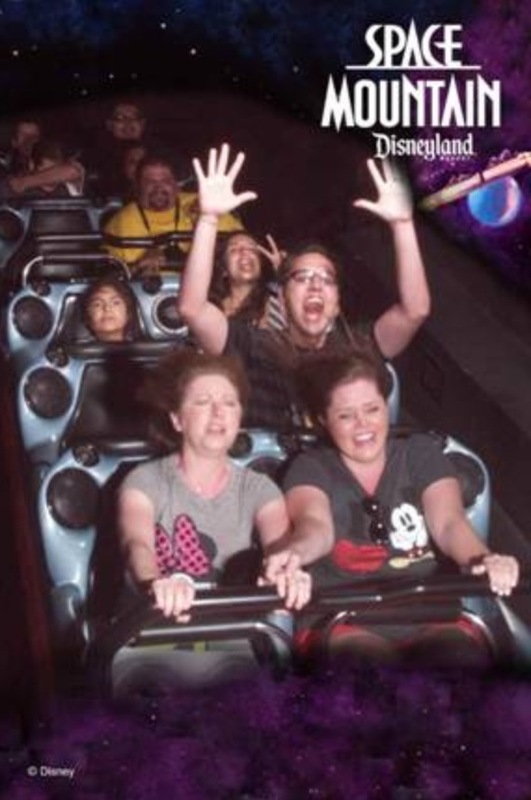 My mom seriously SCREAMED the entire ride. She alternated between, “OH MY GOSH!! !”, “HELP!!!! !”, AND “I’M GOING TO DIE!!!!!!”. I told Louis later, I would have paid $500 for a video of her on the ride. It was probably the highlight of my entire summer. After the thrill of Space Mountain, we decided something slightly tamer was in order. 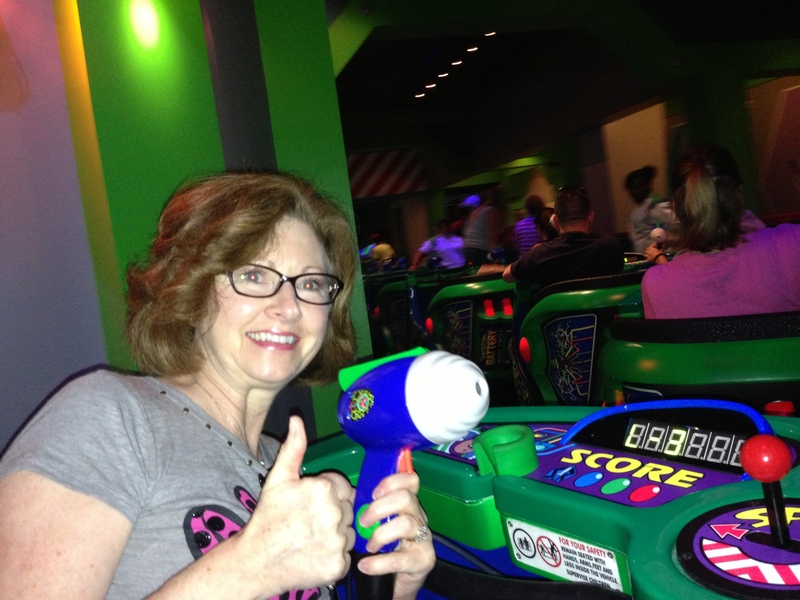 We hopped on Buzz Lightyear’s Astro Blasters, and my mom promptly tripled my score! She’s like some sort of shooting wizard! Saving the galaxy one shot at a time! 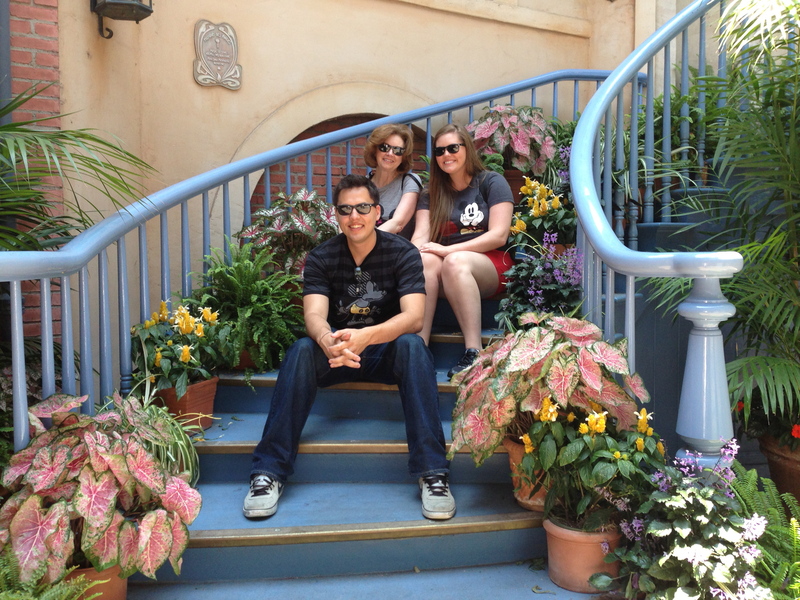 We then headed over to New Orleans Square to enjoy Haunted Mansion, Pirates of the Caribbean, and lunch at French Market. 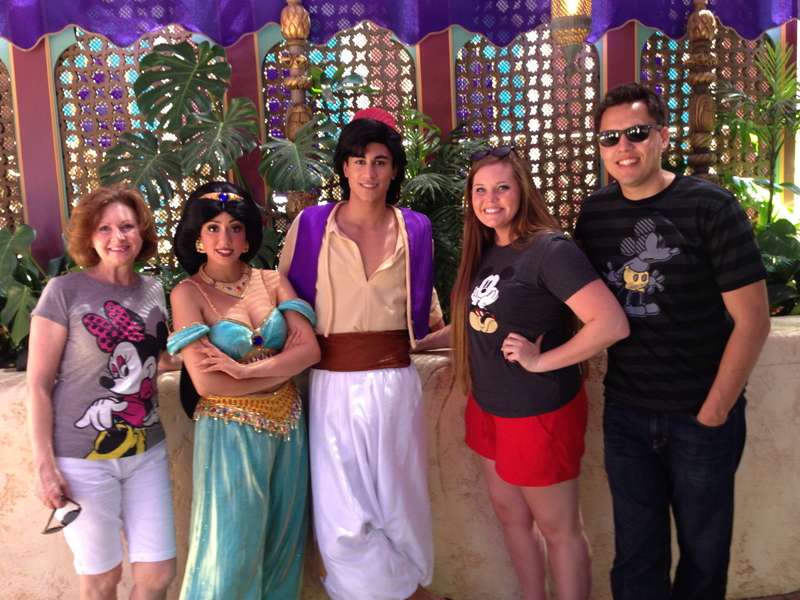 On our way there, we stopped for a picture with Aladdin and Jasmine. 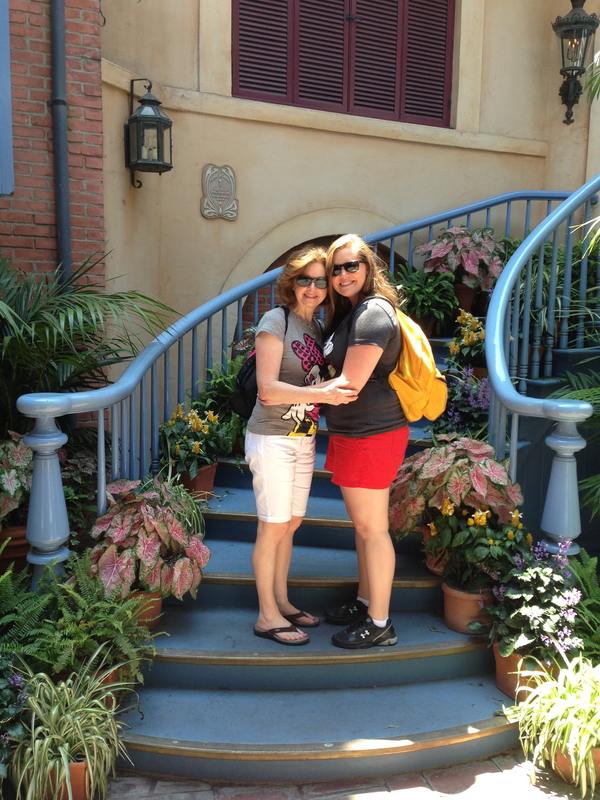 With mom in the Court of Angels in New Orleans Square! 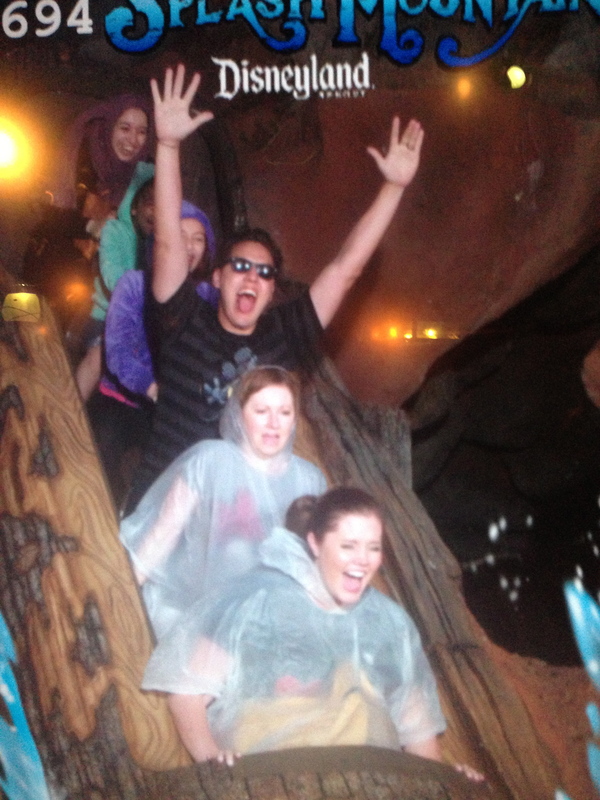 After getting soaked on Splash Mountain, we headed to the bathroom, so my mom could change out of her wet clothes. She really came prepared! 🙂 Knowing that Space and Splash were over, it was like a weight was lifted off of her shoulders! We set off to enjoy the rest of the day. First up was character pictures! 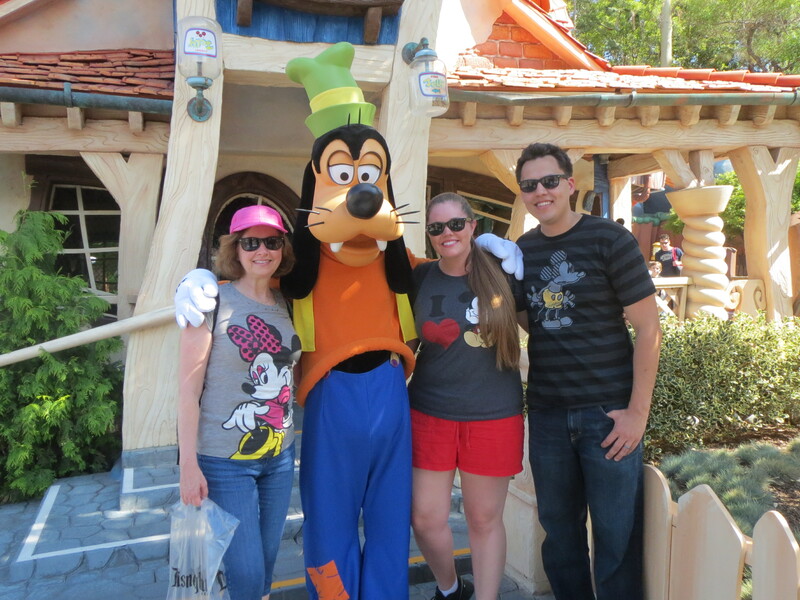 Goofy in front of his kooky house! Meeting the big cheese himself! 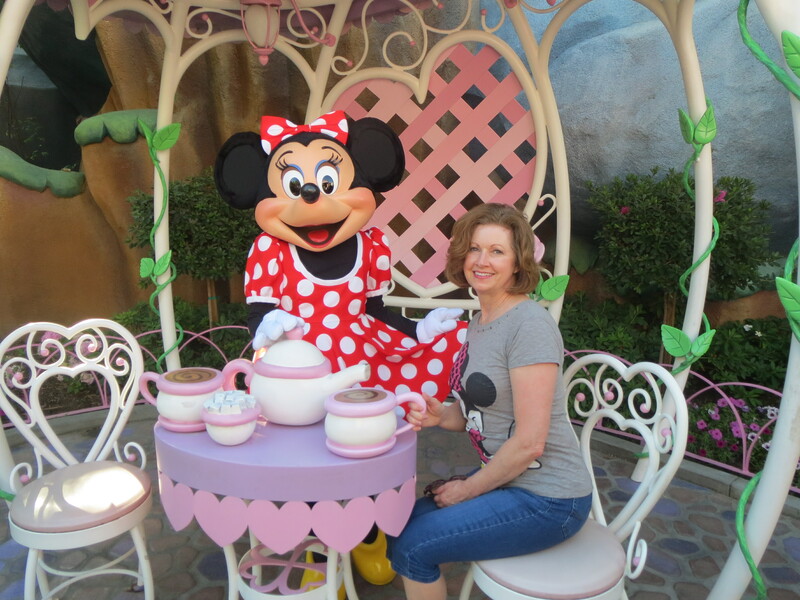 Mom enjoying tea with Minnie at her home! 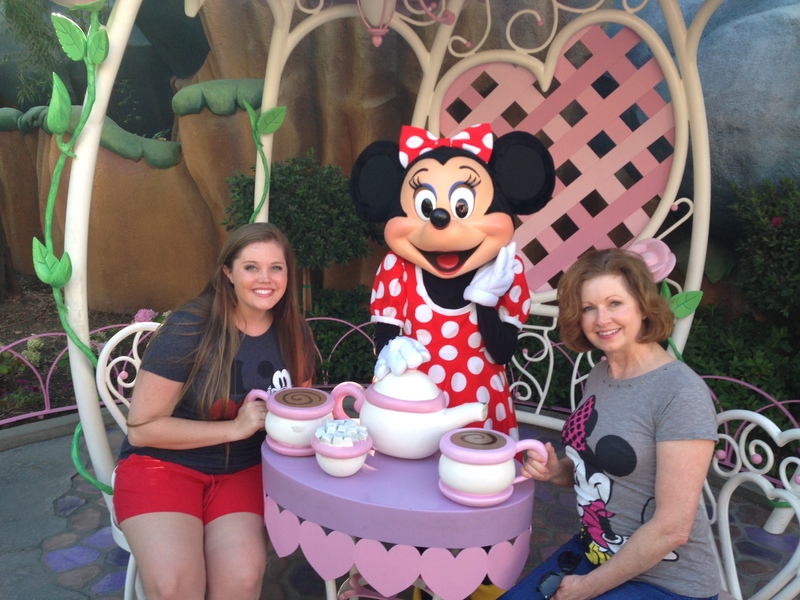 Mom let me join her and Minnie for tea! 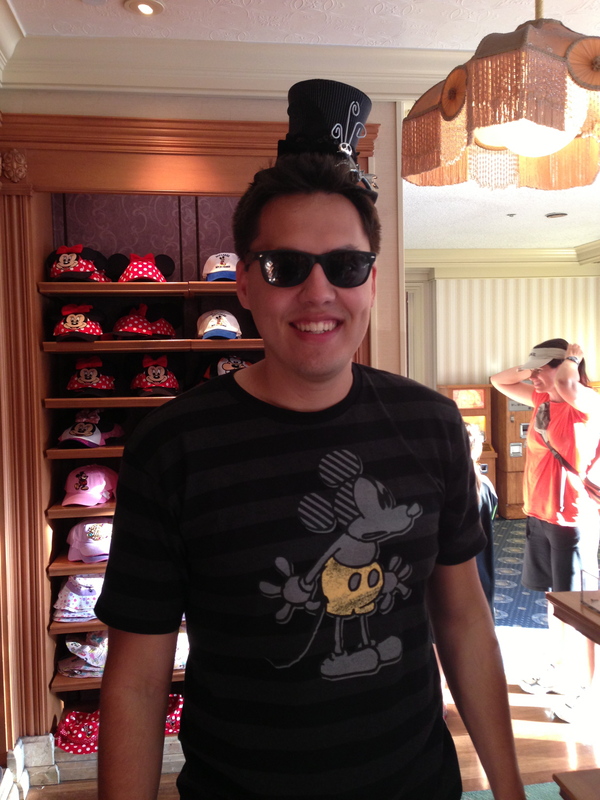 After hanging around in Toontown for a bit, we decided to do some souvenir shopping before dinner on Main Street. 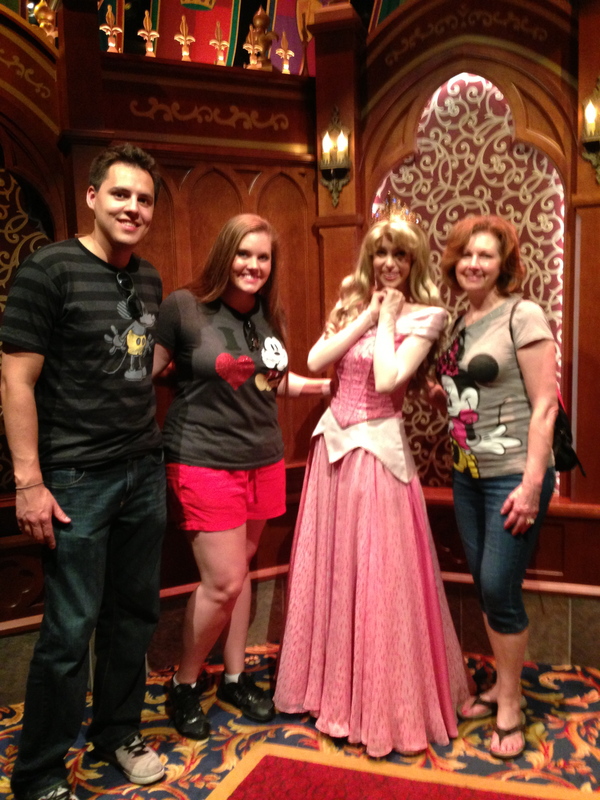 As we were walking towards Main Street, I ran into a cast member I met on 4th of July. His name was Levi, and he was so friendly. He remembered me as well, and while we talked, I told him how my mom was visiting Disneyland, and we were spending the day fitting in all of her favorite things. He asked us to hold on for a moment, and when he came back, he told us he had put us on the list for VIP Fireworks viewing!!! We were soooo excited! 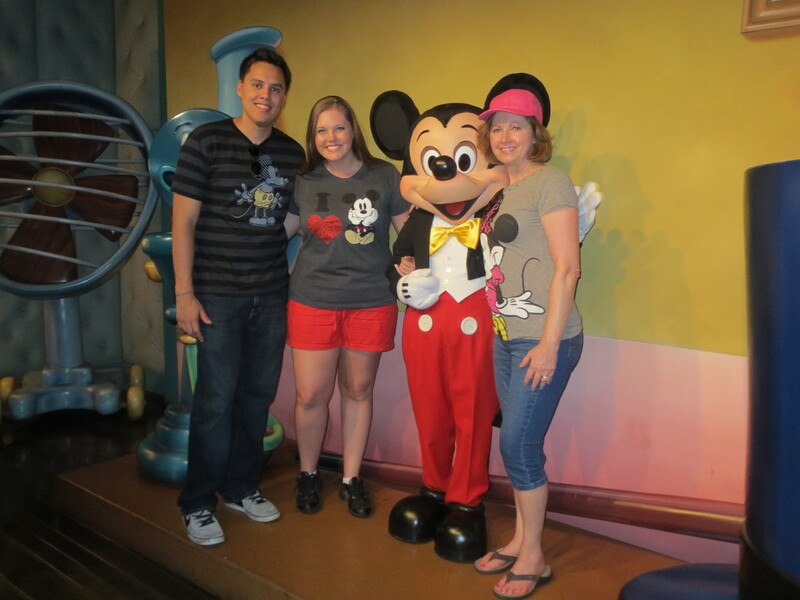 I know it sounds cheesy, but I seriously think God had me meet him on July 4th, so I would see him again with my mom and be able to have VIP seats for her Disney day. Full of excitement we headed to look for my mom a Disney ornament and Henry some monogrammed Mickey ears! You’re never too young to start being a Disney fan, after all. Louis being silly in the hat store! We also stopped on Main Street to watch Mickey’s Soundsational Parade. 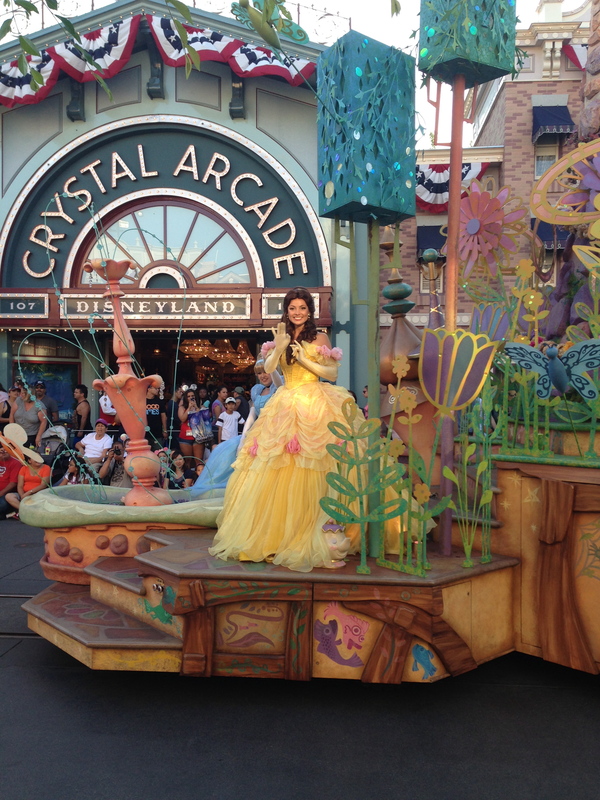 It’s such an amazing parade, and while the princess float was going by, Belle noticed my mom and waved right at her! She was beautiful…definitely still my favorite princess! 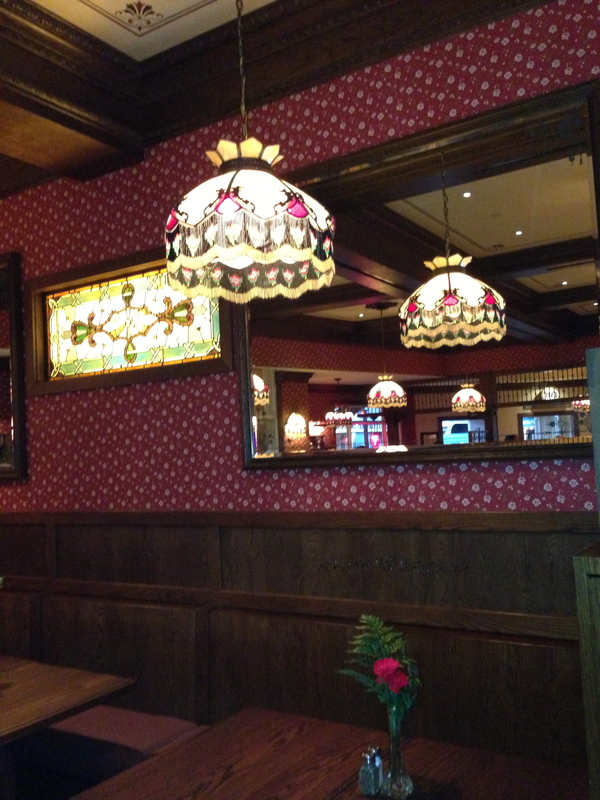 After the parade, my mom treated us to a delicious dinner at Carnation Cafe on Main Street. We enjoyed the special of the day (Shrimp Alfredo Penne Pasta), and Louis ordered Mac ‘n Cheese (because he’s a big kid at heart). 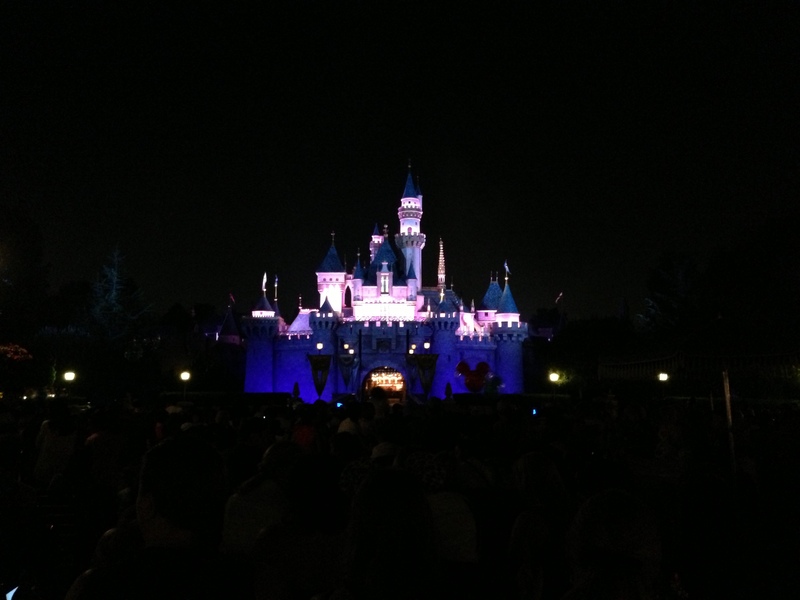 Not long after dinner, it was time to grab our snacks for Magical Fireworks Spectacular and head to our VIP seats! The view was absolutely incredible. The show was so beautiful, and I’m so thankful my mom got to experience it with us from our amazing seats. 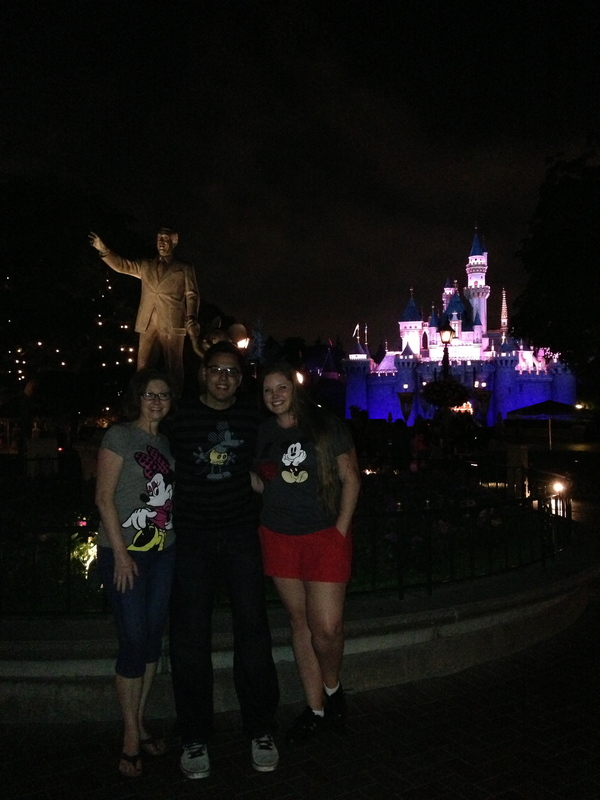 After the Magical show, we strolled over to enjoy Fantasmic! in the Rivers of America. Finally, we enjoyed a late night ride on Haunted Mansion and snapped some pictures in front of the castle as the park was closing for the evening. 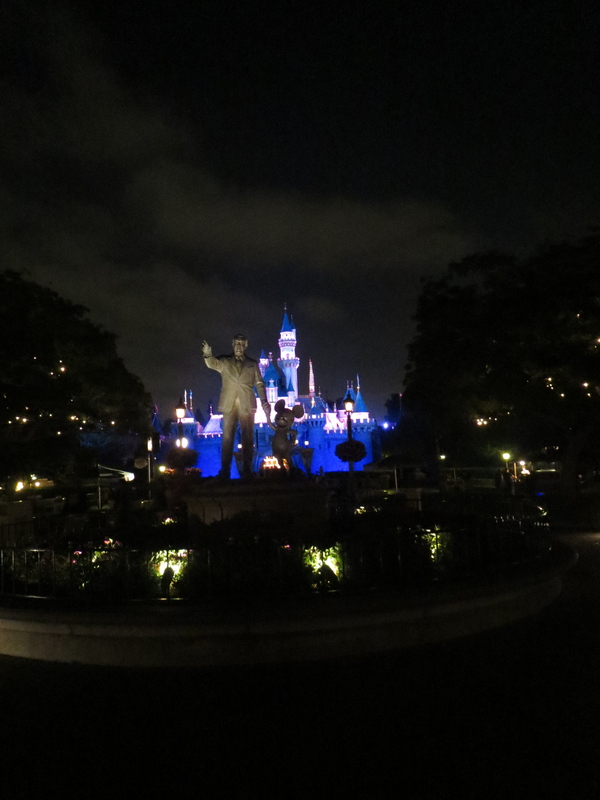 The beautiful castle with Walt waving goodbye for the night! After a long, fun-filled day! It was such an amazing day, and I wouldn’t have changed a thing about it! 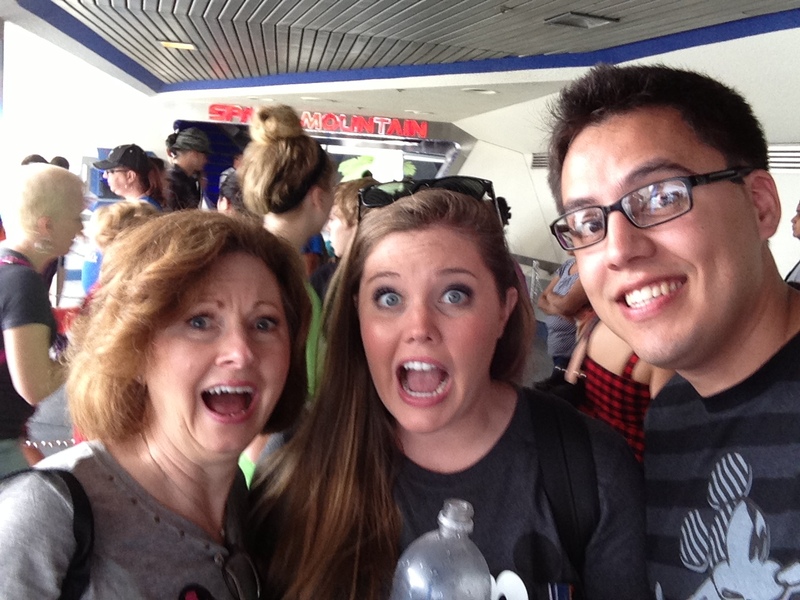 I loved how my mom was brave enough to ride Splash & Space Mountain. 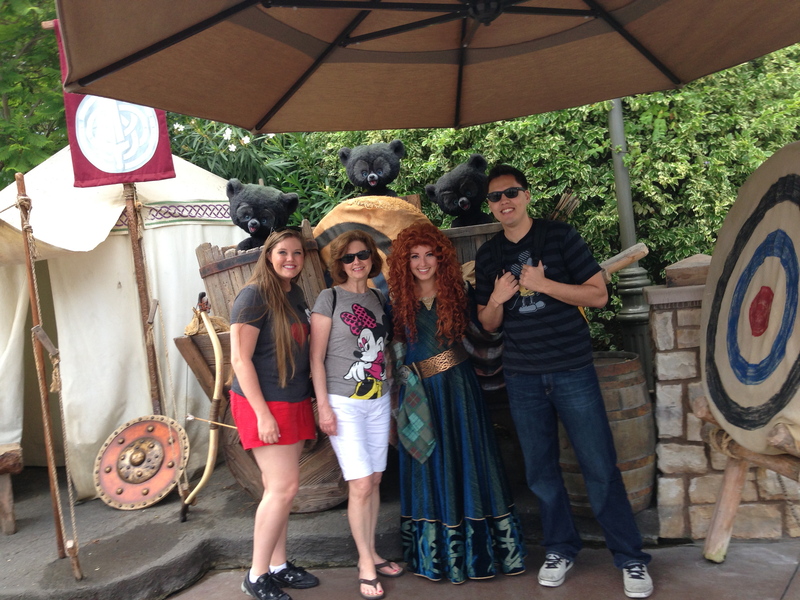 I loved how we got to meet so many characters. I loved that we opened and closed the park. And I LOVED that we got VIP seats for the fireworks. 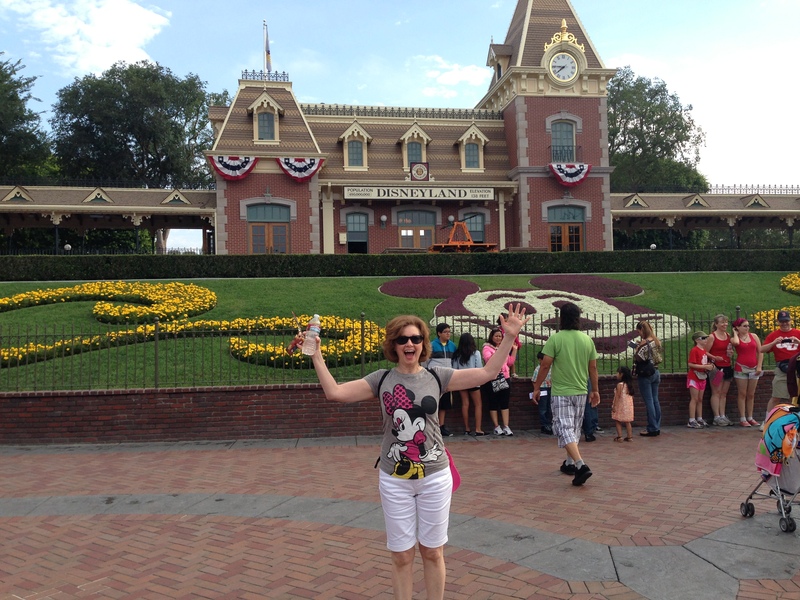 We had SUCH a blast, and I love that we got to experience Disneyland with my mom! 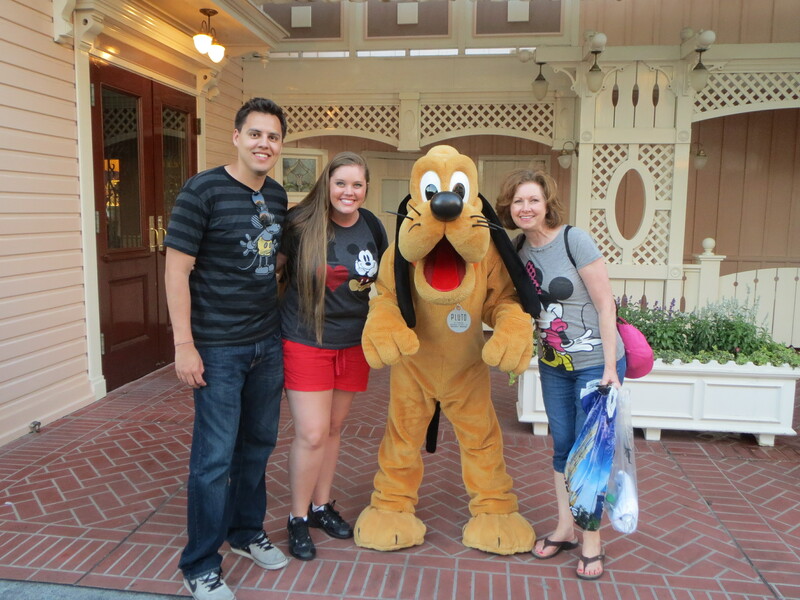 Hopefully next time we head to a Disney park, it will be with the whole family! That was truly the best trip of my life!!! 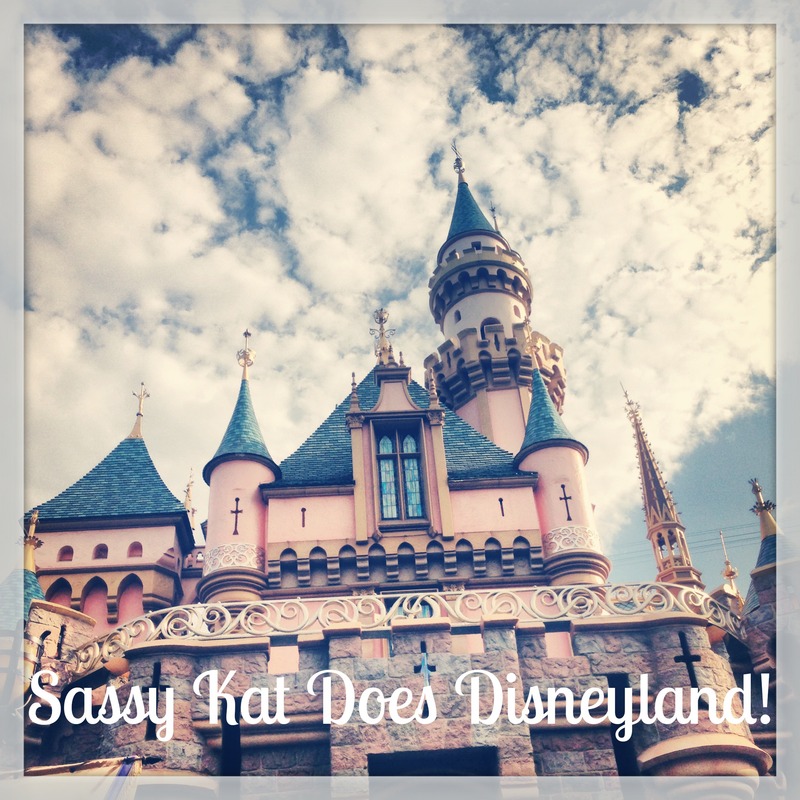 I will always remember the sweet memories I made with you & Louis at Disneyland!! Thank you for making it possible! Love you!!!!! 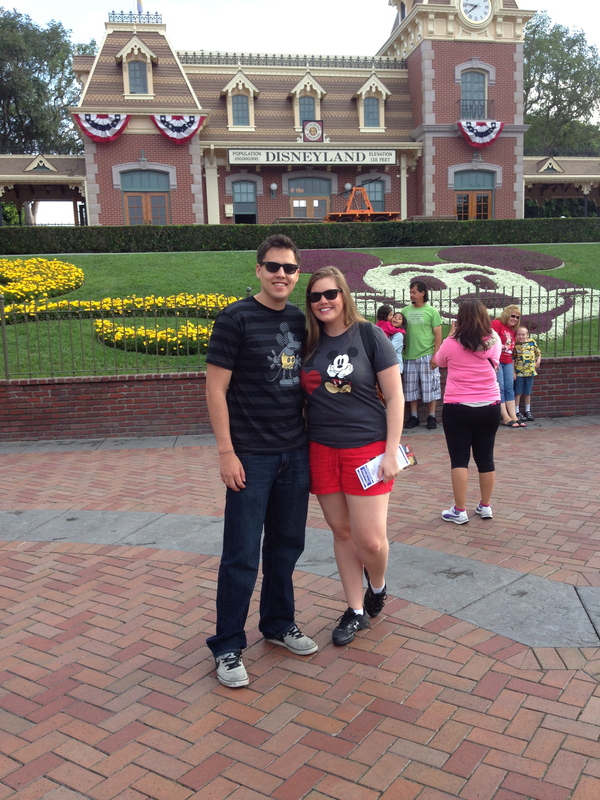 Disneyland was SUCH a blast with you! Love you too!